Our featured member for January 2015 is Karim Abouelnage. 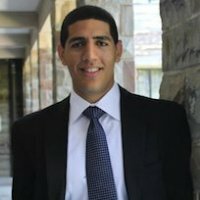 Karim Abouelnaga is the founder of Practice Makes Perfect, a nonprofit that works to narrow the achievement gap by providing low-income students with mentorship and resources that are beyond the reach of their inner-city public schools. Karim has been featured in the New York Times and awarded several distinctions, including the Echoing Green Fellowship, Robinson Appel Humanitarian Award, Pearson Prize National Fellowship, and recently named to Forbes 30 under 30 in Education. Read more about Karim’s experiences below. Many people use their spare time to volunteer for organizations or causes they are passionate about. What motivated you to forgo a more traditional and secure corporate career path and dedicate yourself full-time to a non-profit? What advice do you have for someone else considering a similar path? As the son of Egyptian immigrants, a single mother raised me after my father passed away when I was 13. I sold candy on school-nights and weekends alongside my brothers to keep my family off the streets. Despite my desire to succeed, my early struggle was the inevitable result of the limited resources and guidance in my public school. Where I grew up, most poor and minority children forfeit their dreams because they have difficulty marshaling resources to succeed in the classroom. My path was different. Fortunately, I benefited from non-profits, such as New York Needs You and Rewarding Achievement, which gave me the chance to work with college graduate mentors and role models. In large part, their belief in me and investment in my success allowed me to escape a dead-end life. One of the largest drivers of problems with our education system and our economy is the achievement gap, the disparity in academic achievement between poor, minority students and their affluent counterparts. While I could not articulate this problem until college, it is one I know intimately, as it plagued my childhood, hobbled the life prospects of my closest childhood friends, and indelibly impacted my community. Compelled by a moral obligation to address this problem, I brought together a group of friends at Cornell in 2011 to go beyond talking about the inequities in education through our nonprofit called Practice Makes Perfect. You’re an author for Entrepreneur.com, where you write tactical tips for entrepreneurs. What’s the most important lesson you’ve learned in your entrepreneurial journey? An entrepreneur’s journey is very much like a compressed and never ending sine wave. 1% of the time you feel like the world couldn’t come to an end any sooner, 1% of the time you feel like you are on top of the world, and the remaining 98% of the time you are either on your way up or on your way down. You need to be humble both on your way up and when you’re at the top. It helps you preserve your energy to push through the lows or when you’re on your way down. In a short time, you’ve built a strong team that supports Practice Makes Perfect. What practical leadership advice do you have for others? Hire people you’re going to truly enjoy working with and take the time to get to know them and what they are passionate about. As you grow, keep in mind what they are interested in and find ways to eventually get them to do more of that. They will appreciate you and continue to work hard. Also, show that you care. People want to see that you pay attention to them and notice even the little things. It takes your relationship beyond simply a professional level into the personal realm, and shows that you value your team as more than just employees or coworkers. For example, I’m really big on birthdays. In the early days with our founding team, I would make it a point to know when it was one of our teammate’s birthdays and put together something for them. It’s that little extra step that we take to notice things that people appreciate. It doesn’t have to be birthdays, but find a way to show your personal connection with your team and show that you care. Get in a routine as much as possible. I try to be in bed by 11 to 11:30 pm at the latest every day, and I’m up by 6 am to go to the gym. If I’m not going to gym, I get to the office or start on my work a bit earlier. I use the weekends to catch up on sleep. This routine works great for me, but everyone is different. Take the time to identify your goals, determine the steps you need to take on a daily basis to achieve these goals, and structure a routine that will put you on a path to achieve your desired results. Another aspect to remember to avoid monotony while designing your routine. While your basic habits should be the same, make sure to mix it up. For example, if you workout every morning, make sure to change it up every week or so. The diversity helps keep your body engaged and constantly working. A similar principle can be applied to you work. Try to take on new and diverse projects that will challenge you. Switch up your afternoon break from grabbing coffee to taking a walk, or alternate where you work in your office from sitting at your desk to standing and working. The goal is make sure you don’t get bored or burn out quickly by adding variety to your routine without removing the key components or structure. What advice do you have for recent grads on successfully navigating life after undergrad? My senior year, I was struggling to decide whether I should take my full-time offer working at a prestigious financial services company or if I should go on my own and work on my startup nonprofit. After months of agonizing over this, I chose the latter. And I have no regrets. I’ve met people I probably would not have met. I enjoy waking up for work, and I am working towards something much greater than myself. Here’s the two pieces of advice I’d offer recent undergrads before they join the workforce. First, scratch your itch. If you want to do something creative or entrepreneurial, do it now. The first person I hired to join my team out of school was someone who has wanted to work at a start-up ever since he graduated. After 2.5 years in the corporate world, he finally got to it. If he could go back in time, I am almost certain he would’ve listened to his gut, and had he scratched that itch to work in a startup earlier, then he wouldn’t be looking to do it later. Secondly, it is not all rosy. When you decide to do what you love, there is a huge emotional investment that you make in your work that may not be there if you were working on something you did not really care about. The compliments are 5x more enjoyable and the criticisms are 10x harsher. Learn to take the former with humility and the latter with optimism. It will be tough, but there is no greater satisfaction than knowing you are creating meaning for your life. Lastly, here is wisdom in the saying that “your dreams are your only limitations.” You can truly achieve whatever you put your mind to, and you can make a difference. Read more about Karim on his blog, connect with him through his Linkedin profile, or follow him on Twitter at @KarimAbouelnaga. Each month, Muppies features one of our members to share about their professional development story and the insights they’ve gained along the way. This interview was originally conducted in January of 2015. Opinions are of the member and do not necessarily reflect the opinions of Muppies, Inc.
Big-Data Startup Founder Shares Career Advice: Identify MentorsEnergy Director Founds MuslimMatters, Inc.